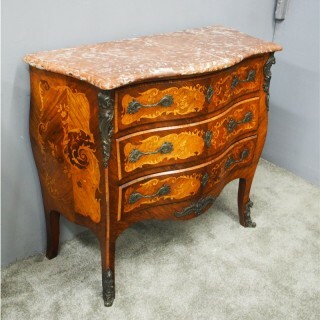 Circa 1880, French kingwood and tulipwood marble top commode. The serpentine fronted variegated pink marble top with a moulded fore edge is over 3 graduated drawers with marquetry inlaid panels and bronze rococo handles and escutcheons. This is above a shaped apron with foliate bronze mount and it has conforming marquetry inlaid sides. The bronze-mounted canted corners extended down as cabriole supports with bronze sabots.